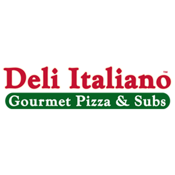 Deli Italiano Gourmet Pizza & Subs has been serving Northern Virginia Fine Italian Specialties since 1990 from all our locations . We proudly guarantee our service and the unmatched quality of our gourmet pizza, American and Italian subs, pasta, Mediterranean sandwich and more. Deli Italiano also specializes in catering any affair, with as little as 2 hour notice.